Prickly Asparagus scientifically known as Asparagus aphyllus is a much-branched, perennial plant with stems that become more or less woody, at least at the base. 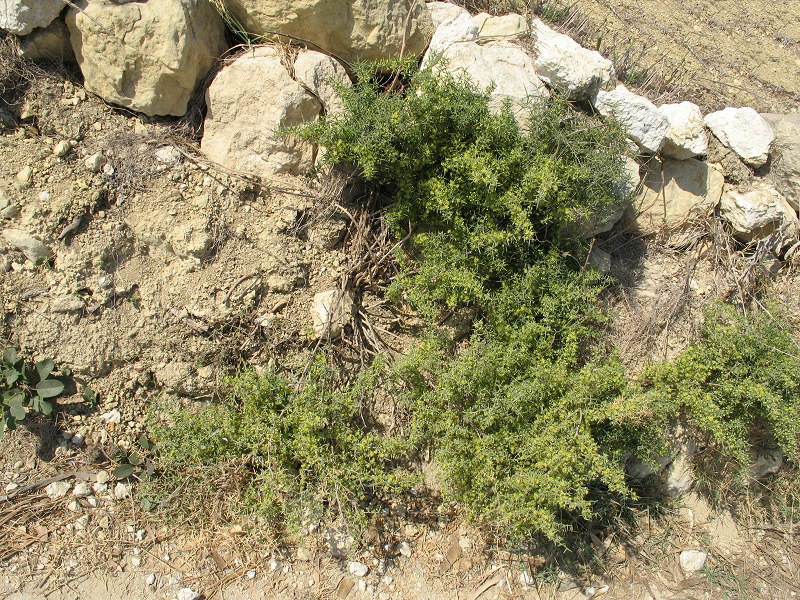 The plant is native throughout the Mediterranean region and eastwards to Saudi Arabia. 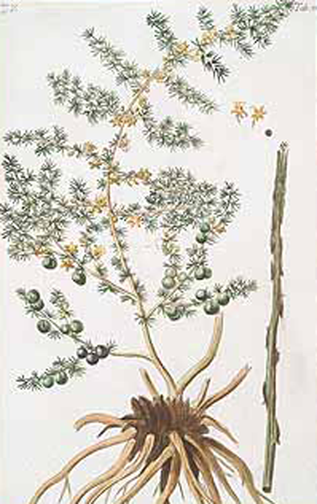 Some of the popular common names of the plant are Mediterranean Asparagus, Prickly Asparagus, Spiny Asparagus, Green-stemmed Asparagus, Israel wild asparagus and Thorny asparagus. 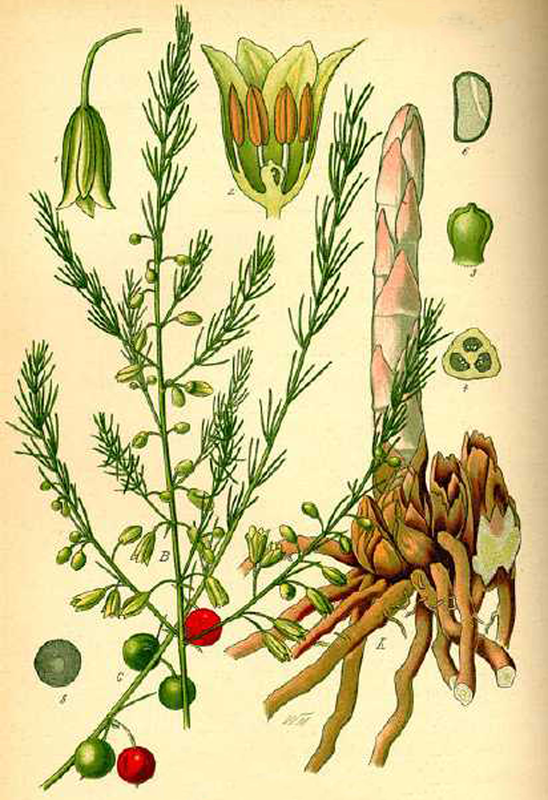 The name for the genus originates from the original Greek word’ asparagos’ that was given to the cultivated asparagus. The specific epithet means without leaves as the pseudo leaves of this plant are actually considered to be flattened leaf like structures. 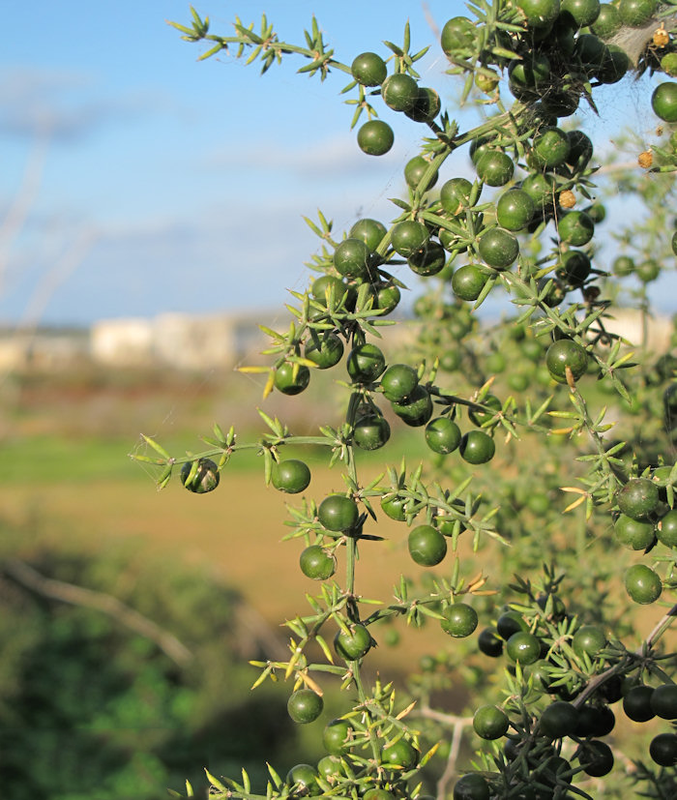 The plant is harvested from the wild for local use as a food. Traditionally it was eaten during Lent in Greece. 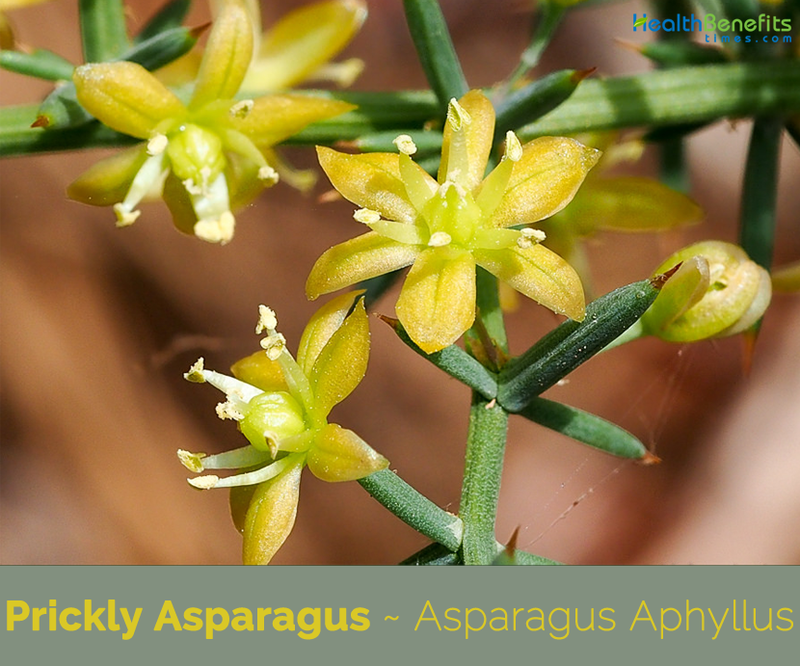 Prickly Asparagus is a much-branched, rhizomatous, perennial plant that grows about 40 – 80 cm tall. 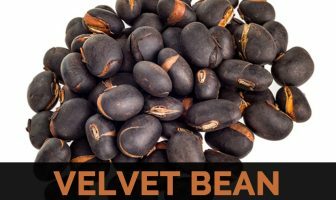 It is found growing in xerophilous woods,shrub lands, hedges, forest edges, coastal dunes, accompanying thickets of camarinha, zimbrais, psamófilos tojais, woodlands, semi-steppe shrub lands, hedges and rocky limestone hills. The plant prefers a rich sandy loam. The plant has tuberous roots. Cladodes are stout and very sharply tipped unequal in length, from 5 to 20 mm long, in clusters of 3 to 7. Stem is thin, woody and very tough. Stalks and branches are smooth and scabrous, green. 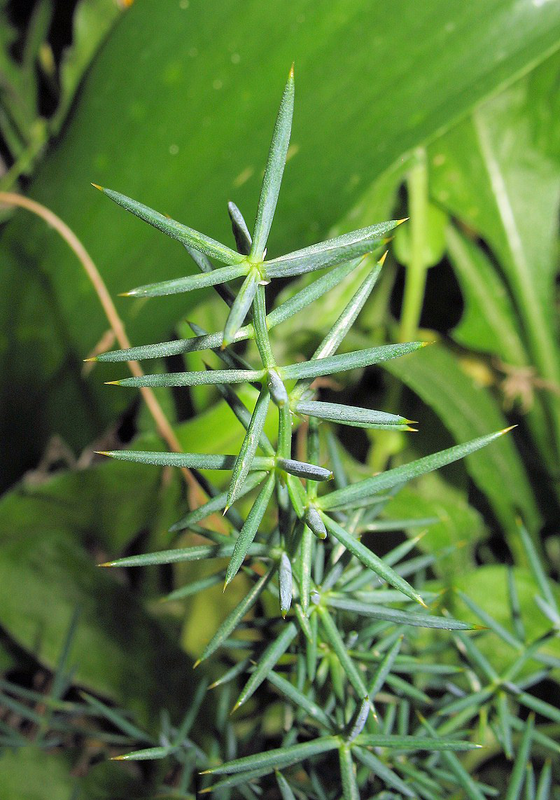 Spur is 1.5-3.5 mm, applied,thorny. 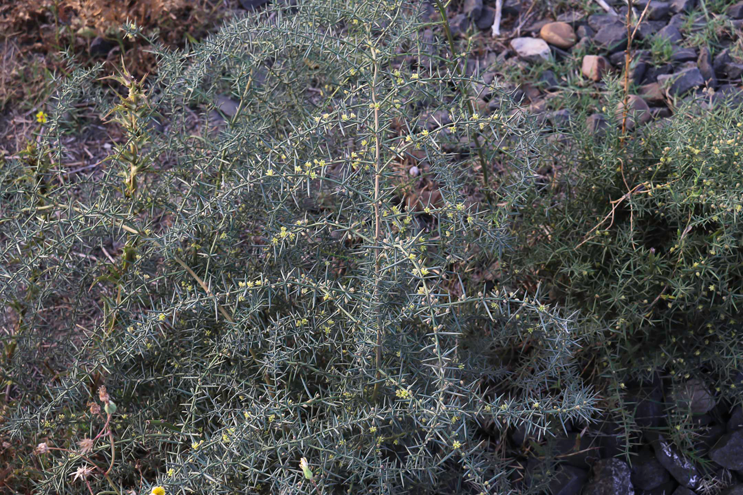 The plant has small, thin, green, aciculate leaves. 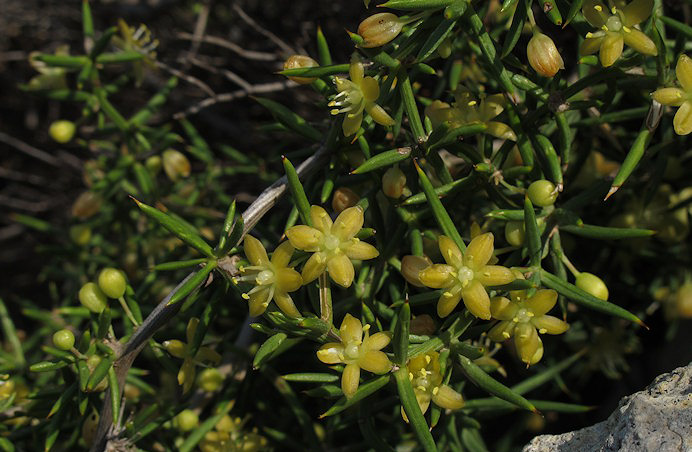 Flowers are small, yellowish-green, axillary, in groups of 3 to 6, short compedicelo. The male flowers have six stamens erect and robust with yellow anthers. 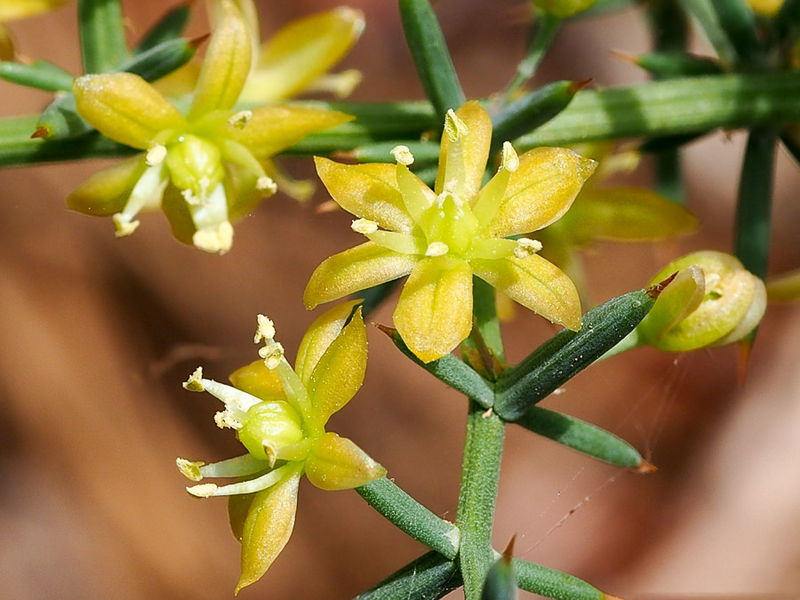 The female flowers have a short stigma with a slightly swollen style. Flowering normally takes place from September, October and November. 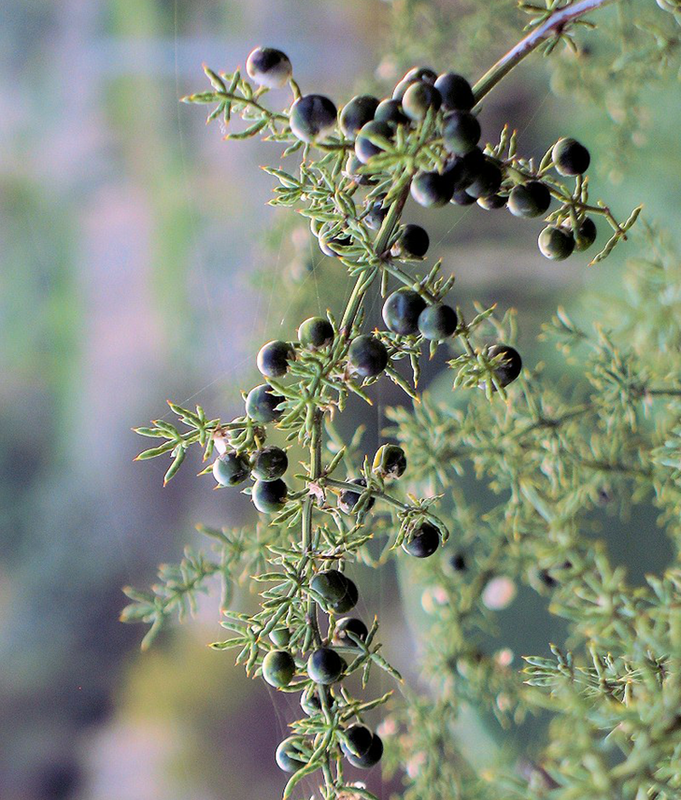 Flowers are followed by spherical, small and hard, 7-8 mm berries in maturation with 1 to 3 seeds.Fruits are initially green turning to reddish and finally black as they mature. Flower Small, yellowish-green, axillary, in groups of 3 to 6, short compedicelo. The male flowers have six stamens erect and robust with yellow anthers. The female flowers have a short stigma with a slightly swollen style. Young shoots can be consumed raw or cooked. Asparagus aphyllus f. macroclados Cout. Asparagus aphyllus f. microclados Cout.